To welcome the beginning of the school year we present a Yiddish children’s song written and composed in New York but sung by the children in Eastern Europe Jewish schools as well. The singer May Schechter (Yiddish name “Menye”) was born in August 1920 in Soroki (Yiddish- Soroke), Bessarabia, then Romania. She died this year, February 2018. 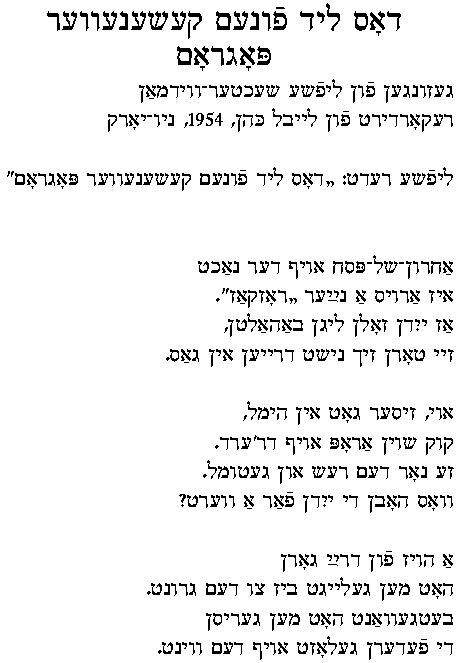 In an interview I conducted with her in 1986 at Circle Lodge, the Workmen’s Circle camp in Hopewell Junction, NY, Schechter explained that the children in Soroki performed this song as part of Zishe Weinper’s (Vaynper) children’s operetta Der bafrayter (The One Who Was Liberated). Der bafrayter was published by Farlag Matones in 1925, NY. We are attaching the Yiddish words and music (composed by N. Zaslavsky/Zaslawsky) as it appeared there. Yosl Kotler did wonderful illustrations for the publication. May Schechter’s husband was Ben Schechter, the long time manager of the Folksbiene Yiddish theater in NY. The poet Zishe Weinper (1893 – 1957) came to America in 1913. He was a central figure in the Yiddish left and a number of his poems appealed to composers, among them “Toybn” and “A pastekhl, a troymer”. His song Zingendik, music by Paul Lamkoff, was another American Yiddish children’s song that became popular in Eastern Europe. The composer Nathan Zaslavsky (1885 – 1965) immigrated to the US in 1900 and composed a number of other Yiddish songs. Sarah Gorby recorded this song twice we are attaching the MP3 of the version on: Sarah Gorby – Yiddish et Judeo-Espagnole (Arton Records). One verse of the song was also recorded by Masha Benye and Workmen Circle school children on the LP Lomir zingen lider far yidishe kinder. Since May Schechter and Sarah Gorby both came from Bessarabia one has to wonder whether the play Der bafrayter was especially popular there. Special thanks to Naomi Schechter for this week’s post, as well as Lorin Sklamberg and the YIVO Sound Archive. eyns un tsvey iz dray. freygt ba mir a flig. tsvey un tsvey iz fir. bluzt es oykh af mir. Blyasket blendt, glit un brent. fir un fir iz akht. ver zhe lakht es dort? Me hert dort nisht keyn vort. finef un finf iz tsen. Vazt mir, vos er ken. Ikh tsi oykh mit zey. Eyns un eyns, eyns un eyns. Eyns un eyns iz tsvey. one and two is three. Zum, zum, zum, zum, zum, zum? two and two is four. and so too it blows on me. A beam of light above. four and four is eight. Not a word is heard. Five and five is ten. Shows me what he can do. and I am drawn to them. Shtiler, shtiler ovntvint (Silent, silent evening wind) is the third song on the blog sung by Yehudis/ Yudeska Eisenman from a 1993 field recording made by Beyle Schaechter-Gottesman in the Bronx. 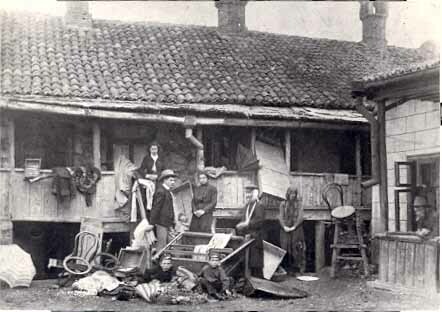 Another recording of the song Shtiler, shtiler ovntvint is found in The Stonehill Jewish Song Archive – a different blog of the Center for Traditional Music and Dance, directed by Dr. Miriam Isaacs. The singer in the Stonehill collection, Menachem Brayer says “This is a Ukrainian song in honor of the fighters for freedom. The words are by me, the melody – unknown.” The link to that slow moving performance of a shortened version of the song is here. 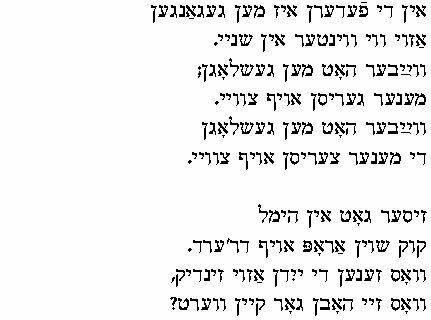 Though Brayer seems to be claiming that he wrote the words to the song, it appears that it is a poem by the Yiddish writer Jacob (Yakov) Fichman (1881 – 1958) from Bălţi, Bessarabia (a town immortalized in the song “Mayn shtetele Belz”). 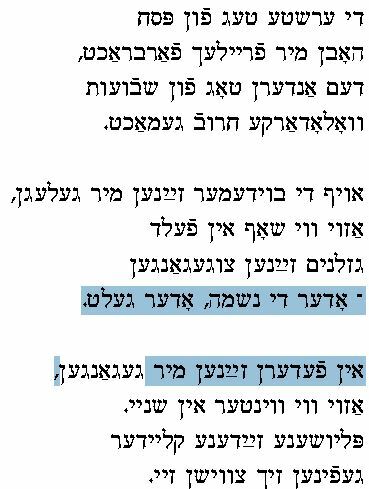 I have yet to find the poem itself but Fichman’s authorship is cited in a work by Shmuel Shapiro אשר לאורם הלכתי 1965, p. 274. Brayer sings the song in the context of the Holocaust; Eisenman does not. kumst fun vaytn land atsind. vu di khvalyes soyden zikh. bsures gute tsu der velt. S’vet fun itst shoyn beser zayn. brengst dem elntn zayn ru. biz der mitog kert tsurik. you are now coming from afar. You come from the endless steppes. You come from the seas which have no end. where the waves whisper to each other. good news to the world. it will be better from now on. bringing the lonely their peace. till the noon hour returns.